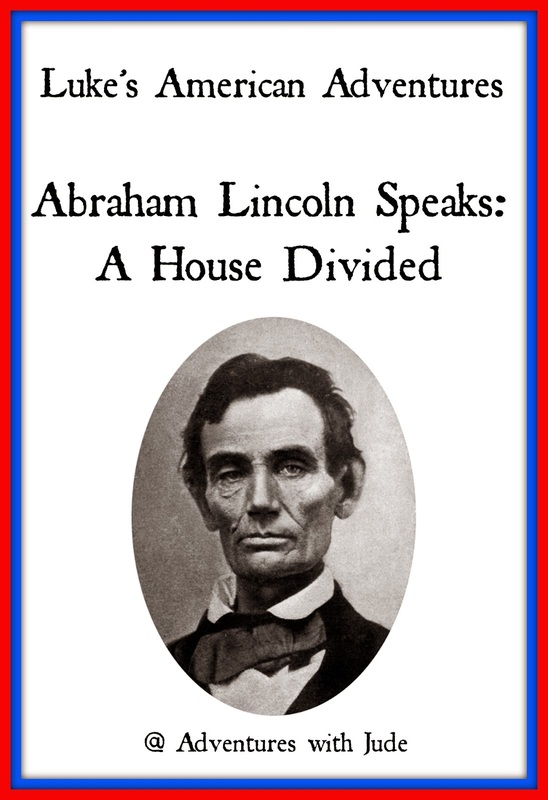 “A House Divided” was the cornerstone theme of Abraham Lincoln’s failed Senate campaign against Stephen A. Douglas. 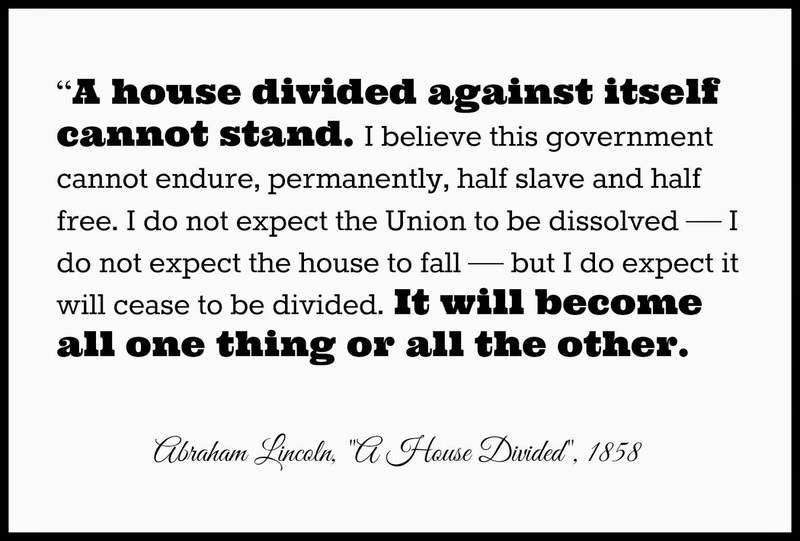 The speech that has become known as A House Divided was delivered on June 16, 1858 at the Illinois Republican Convention. Lincoln's philosophy was the United States could no longer contain two separate governments - slave and free - and still function as a unit. In Lincoln’s metaphor, the United States of America — the “house” -- is shown “divided against itself” between pro-slavery and abolitionist forces. The Missouri Compromise of 1820 decreed that all states and territories north of the 36°30' parallel would enter the nation as free states - no slaves allowed. Lands south of this line would be permitted to retain slaves. However, in 1854, Stephen Douglas - Senator from Illinois - introduced The Kansas-Nebraska Act that nullified the Compromise and allowed states to choose slavery status for themselves by popular vote. Lincoln hoped using a well-known figure of speech would help rouse the people to recognize the magnitude of this Act. Why did Lincoln choose a Bible passage as the foundation for his platform? It certainly highlighted the theme, but Lincoln knew it would be familiar to nearly all voters. Rich or poor, educated or illiterate, nearly every man was familiar with the Gospel of Matthew. Scholars estimate that about 80% of white males were literate, but nearly all had memorized any number of verses from the Bible. Often, the Bible was a child’s first storybook, character trainer, and reading primer, so it would have been a rare person who was unfamiliar with this warning. Lincoln's goal was to set himself apart from Stephen Douglas. Douglas’ advocacy of popular sovereignty had become the law of the land. In theory, it was the “of the people, by the people, for the people” way to decide the state’s position. Douglas believed the proper application of popular sovereignty would end slavery-induced conflict and would allow northern and southern states to resume their peaceful coexistence. Unfortunately, letting popular sovereignty choose the way of the economy meant there was always going to be a minority faction unhappy with the decision. Often it would contribute to either civil dissent (such as the near-civil war named “Bleeding Kansas”), or unstable economies when strong supporters of one side or the other relocated to a more politically favorable state. 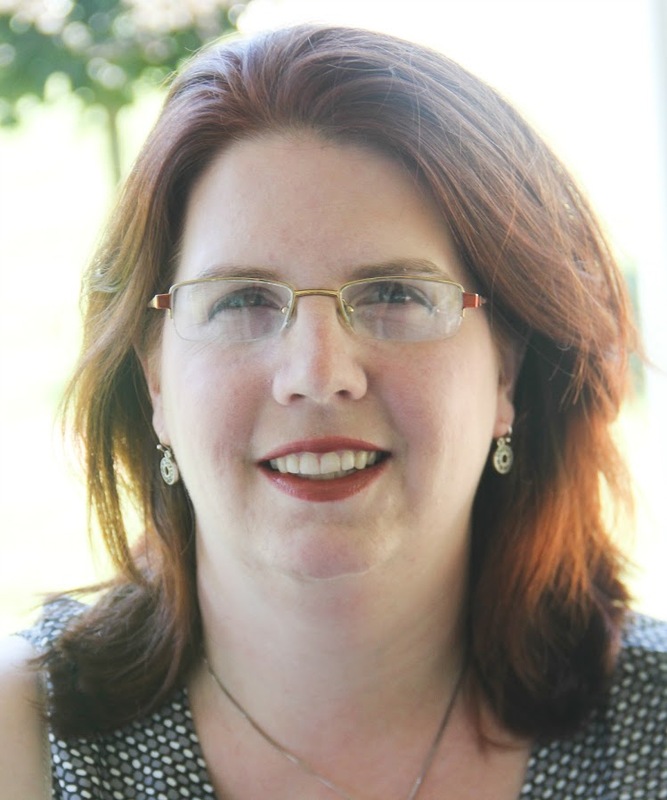 The Republican party in Illinois wanted to uphold the beliefs and ideals set by the Founding Fathers in the Declaration of Independence and Constitution. When the Founding Fathers drafted these documents, slave-holding Southern states would not agree to them unless they were allowed to keep their slaves. This was a particular issue with the Declaration of Independence - a unanimous vote was required for passage. It was agreed that free states would remain free, and slavery would be contained to its current location. By the late 1850s, slavery was spreading across the land. The Republican party wanted to keep it from taking over the north, which would be possible if enough people in a northern state voted to allow slavery. Lincoln himself did not express a particular pro- or anti-slave view; his opinion was that the nation had to decide the “Slave or Free” issues as a whole and move on. At this time in U.S. history, United States Senators were chosen by their respective state legislatures. This means that a candidate did not campaign for himself, but for his party. 1858 was an election year for the Illinois State House, so Douglas decided to enhances his own chances of being re-chosen by campaigning for Democratic legislators. (If Democrats held the majority of seats in Illinois, they would keep him as their Senator.) With the help of a friend who ran the railroad, Douglas traveled the state giving speeches. But wherever he went, the young and untried but tenacious Republican candidate would show up two days later, give voters reasons not to trust Douglas, and get the last word in. Finally, Douglas agreed to meet Abraham Lincoln face to face in a series of debates in the remaining Congressional districts in the state. 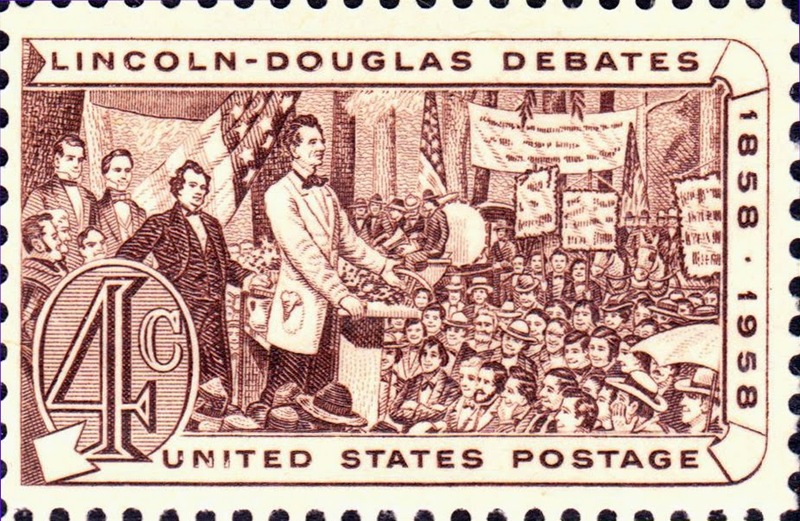 There were seven Lincoln-Douglas debates, in which the two candidates for Senate squared off against each other, challenging the other's ideas about, among other topics, slavery and its future in the United States. Even though these speeches were intended to help elect their respective parties' state legislators, the events attracted tens of thousands of people. The audiences turned the debates into a sporting event, shouting out questions, cheering, booing and laughing. Reporters in Chicago transcribed the speeches, and thanks to the telegraph, the Lincoln-Douglas debates were reported by newspapers across the entire nation and followed closely by the American people. Lincoln's remarks in Springfield created an image of the dangers of slavery-based disunion. Democratic candidate Stephen Douglas believed the use of popular sovereignty would resolve the issue of slavery. Lincoln, however, believed if the states were left to decide for themselves, the fighting would only worsen. He believed that the nation as a whole needed to make a decision to be either all slave or all free, stating, “A house divided against itself cannot stand.” His speech publicly voices a prophecy for the future. 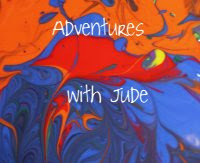 Part 3: Liberty for All?